The topic in question today that I have returned to and is boiling my blood is military spending, our war economy. I’ve just read a review for a “must read” book, and I’d love to read it, I want to read it, but I fear for my health. 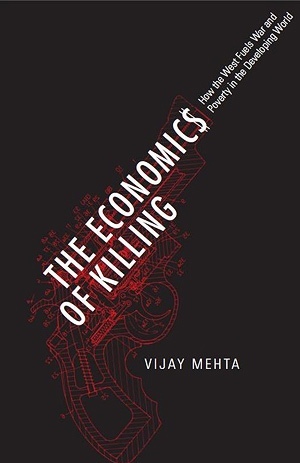 It is “The Economics of Killing: How the West Fuels War and Poverty in the Developing World” by Vijay Mehta. The review is actually an “In my own words” review in Resurgence magazine. Vijay summarises the way that we spend on weapons, the figures for 2011 show that we spent US$1.74 trillion on arms globally. This is totally meaningless for me, it’s like discussing the money that the banks create each year, or discussing debt repayments for Greece, these numbers are too big and don’t register. What does register is the reality of this spending for the people who are affected by this spending. Developing countries buy arms out of the climate of fear that is encouraged by the big military nations, they can’t afford to do this but they still do. The result is that they can’t look after their own people, which is what their priority ought to be. Another comment that Vijay makes is that the US military is the world’s single largest user of petroleum! I can’t go on listing these things, my blood pressure is going up and my spelling is getting wosre! Basically, a huge amount of our global resources go into making things that we either never use, or if we use them they are used for destructive purposes, and the process of making them in the first place is destructive. The money, people and resources caught up in the war economy could be doing something so much more constructive like irrigation, health care, pollution control, education, sustainable communities, etc. So why do we keep on doing it? And those of us who want it to stop, how do we stop it? We try sayin “not in my name” but it is our government, our money, our wealth, our way of life that this war economy is designed to protect. Is resistance futile? Can we do something about this? This entry was posted in Arms Trade, Economics, Energy, Environment, society. Bookmark the permalink.